No, it’s not really a misleading title. So don’t sue me for misrepresentation. And double bonus, it doesn’t need a hugely long post to explain it. Now it’s not a groundbreaking solution or a brand new idea, but it is one that I have only just implemented and been taken aback by the results. Have a online quote form available on your website. Since adopting a Wufoo form for ImJustCreative, the flow of quote requests has more than doubled. At least for me. Granted some of it could be just coincidence and good fortune. But ever since, I am receiving more direct approaches for work than I did. Granted, not all end in work, but it certainly helps with general confidence and state of mind if nothing else. There is a very real benefit to have a quote form accessible in this way. Initially I was dubious, personally I hate filling in lengthy forms, so just naively assumed that this would be same for a lot of people. Seemingly not true. And I would suggest not something to sniff at either. If you don’t have a online form, and business is slow, then I can strongly recommend getting one fixed up pronto. Make it as easy and as accessible as possible for people to approach you or contact you. It is no myth that in today’s day and age of texting, instant messaging, emailing, facebooking, twittering, the use of the voice call comes a distant last place for many people. Certainly I have experienced many time when I have suggested talking on the phone to a client or contact only to hear every conceivable alternative option to communicate. Seems we are becoming a generation adverse to vocal communication given the immediacy of instant messaging in its many guises. So it’s then logical to assume that for potential clients, some who may not want to call for what ever reason, by not giving them option of the online quote form is potentially bad for new business. So this is just a head’s up. Something to try if you are struggling to find new work. I believe that many people, such as myself are daunted by the seemingly complex nature of more complex data forms, hence why many sites don’t offer them, apart from the standard contact form of which there are a myriad of WordPress plugins. But WuFoo is the answer you are looking for if you are technically challenged or even just don’t have time to code a form even if you could do it. Wufoo makes it so easy to create any length of form with any combination of text fields you could possibly want. With numerous options to integrate said form into your website as a embedded page, as mine is, or off-site links, pop-ups etc. It it ultimately flexible. 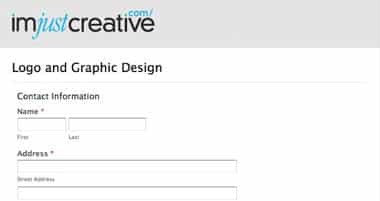 You have control over the design of the form, using CSS if you feel the need. 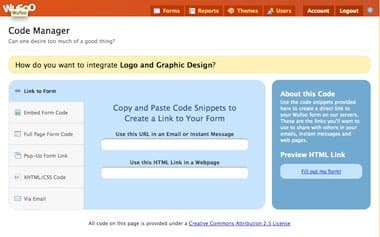 There are a number of set themes and of course you can brand the default themes with your own logo. As you can see from the pic below there are a number of pricing plans with the defacto ‘free’ plan, which may just suit a purpose. But frankly, if you want a detailed form, then you will be restricted with the 10 field minimum. This is my only grumble with WuFoo, the need for more than 10 fields is highly probably for most people, yet the only option up from the ‘free’ is the $9.95. May not seem much, but if you only need one form then it’s certainly overkill, unless you can share the package. It’s not a cheap option by any means, but the flip side is that it’s super convenient. And if you opt for it, see positive results, it may just pay for itself, or you could then decided to have someone code you a custom form. So look at Wufoo forms as a excellent primer, test bed for online quoting.